There are twelve squares on the quilt I'm mending. I have so far finished repairing three of them. At this rate, I certainly won't finish by the end of the week. I'm not very fast at hand-sewing. Still, I'm glad to be making progress! The Pig: there's obviously a piece missing where his ear should be. I'm going to have to figure out the proper pig ear shape to replace it. Any ideas what that shape should be? 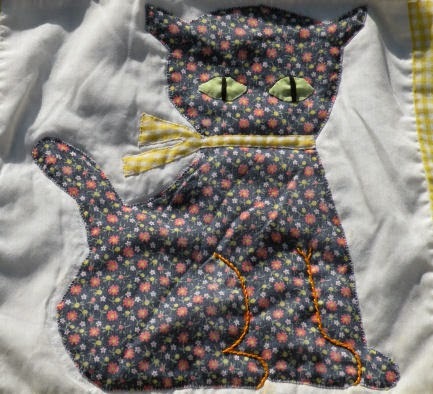 The Cat: In addition to re-stitching the applique to the quilt square, I replaced the embroidery on the legs and eyes. You could see where it had been 'cause the fabric was less faded there. Sadly, my embroidery skills just aren't as marvelous as Grandma's! 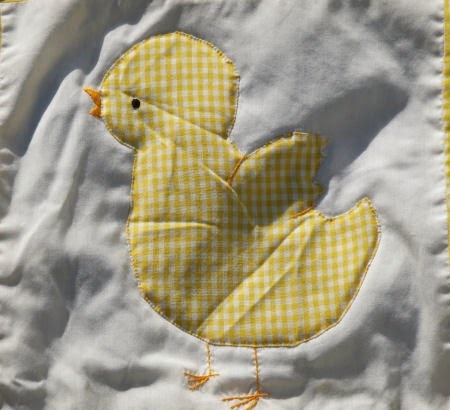 The Chick: All the embroidered bits were still intact for this one. I just had to stitch down the applique piece again. I also sewed buttons on two sweaters that I knitted last year (while pregnant) and put snaps on a little dress that used to have buttons. I'll take pictures of them tonight and show you tomorrow! Aww! That quilt is so sweet. It's such a great piece of family history. I'm so glad you are making headway! We'd love it if you link this post up with our Mending Week. I'm leaving the Mr. Linky up until Monday though, so you do have time. I'm hoping to post a photo of your quilt on our blog tonight. 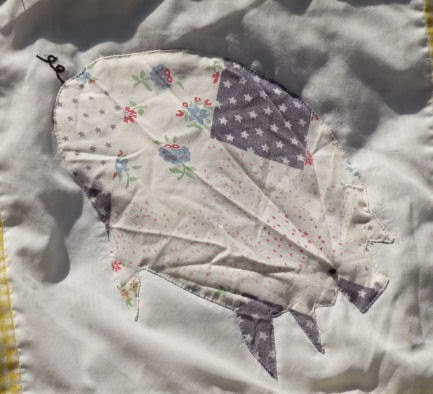 The pattern for your baby quilt can be found in the book entitled, Better Homes and Garden Applique, pages 16 and 17 (printed in 1978). Oh wow, thank you for finding it for me! I have a bunch of craft books my grandma passed on to me, but that wasn't among them. I may have to go buy it off of Amazon. I have two copies if you would be interested. I could send one (free) or copy those pages mentioned, whatever you desire.